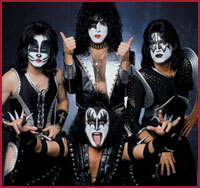 Kiss is the hard rocking, heavy metal band famous for their makeup, blood spitting and fire breathing performances. They have 24 gold albums so far. Simmons 1978 solo album included collaborations from Aerosmith's Joe Perry, Cheap Trick's Rick Nielsen, the Doobie Brothers' Jeff "Skunk" Baxter, Donna Summer, Janis Ian, Helen Reddy, Bob Seger, and Cher.